The legislature has approved on the final day of its 2016 session a bill that would expand Missourians’ gun rights, including the addition to state law of a “stand your ground” provision. A “stand your ground” law lets an individual use deadly force in self-defense without retreating in the face of what he or she considers a threat. Democrats like Representative Lauren Arthur (D-Kansas City) said it would increase gun violence. “This is a stupid, dangerous piece of legislation,” Arthur said during floor debate before the final vote on the bill. “One of the last bills that we’re considering on this floor is going to result in the loss of life,” said Representative Tracy Newman (D-St. Louis). Republicans say the provision is about letting Missourians protect themselves and others. Representative Rick Brattin (R-Harrisonville) said “stand your ground” isn’t just about guns. “It’s pertaining to you have the right and the ability to protect yourselves by all means,” said Brattin. The legislation also includes a provision allowing a guest in a home to use deadly force to defend his or her self. 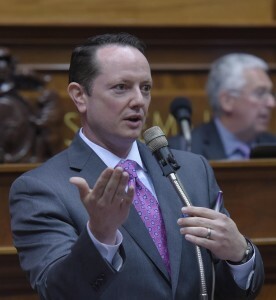 Representative Denny Hoskins (R-Warrensburg) said that’s an expansion of Missouri’s “castle doctrine,” which lets a person use deadly force to defend his or her home or property. “The loss of life should not be myself, or my family, or my kids. The loss of life should be the intruder that is coming into my house to try and harm my family,” said Hoskins. Another provision referred to as “constitutional carry” makes legal the carrying of concealed weapons by a legal gun owner anywhere he or she can openly carry a gun. Governor Jay Nixon (D) said he hasn’t had time to review the entire bill, but said that piece is a significant departure from Missouri’s current system, which allows the carrying of concealed guns only by those with a permit to do so. It’s now up to Nixon whether to veto that bill, sign it into law, or let it become law without his action. The legislation is SB 656.